There is a lot of buzz surrounding the Raspberry Pi platform. Due to its eye-popping capabilities and low price, engineers are investigating more ways to use it in their designs. Raspberry Pi is the 3rd best-selling general-purpose computer platform, trailing only the Microsoft® Windows® PC and Apple® Macintosh®, with over 12.5 million sold as of 2017. The secrets to its success are in price, performance, and flexibility. For $35 the Raspberry Pi 3 Model B+ offers a 64-bit quad-core ARM processor, gigabit ethernet, wireless, Bluetooth, 4 USB ports, micro SD slot, and HDMI output. While originally created for the education market to teach computer science to students across the globe, it has rapidly expanded beyond the intended market into the hobbyist/maker market and increasingly into industrial/commercial markets. The power and capabilities of the Raspberry Pi is starting to be leveraged widely across industry, including by Measurement Computing where it is integrated into the design of its WebDAQ Series of data loggers. With the Raspberry Pi Compute Module 3 and a data acquisition device, MCC created the high performance WebDAQ 504 acoustic/vibration data logger which acquires and logs 4 channels of 24-bit data, performs an FFT on all 4 channels, and displays the data to the user from a responsive web server. The success of the Raspberry Pi in processor intensive, professional engineering applications such as this demonstrates why it is now being considered as an OEM option for industrial designs. The Raspberry Pi does not have built-in Test and Measurement capabilities such as Analog-to-Digital Converters (ADCs), Digital-to-Analog Converters (DACs), or conditioned Digital Inputs and Outputs (DIO). These capabilities can, however, be expanded either through the USB port or a 40-pin header that provides GPIO pins which support both SPI and I2C. A device that connects directly to the 40-pin device and stack on the Raspberry Pi is called a HAT (Hardware Attached on Top). Over the years, individuals have published open-source designs and small companies have sold low-cost HATs for a variety of tasks, including support for analog and digital I/O. These designs and products are adequate for the education and hobbyist/maker market but have some serious short comings for professional Test and Measurement applications. Most of these devices are provided partially assembled, without specifications or programming support, and without performance guarantees that can only be achieved with a thorough device validation process. Device validation is a vitally important step in the design process as it ensures that quality metrics are adhered to and the product performs as specified. Without this process, data derived from the product might be inaccurate and endanger results that are shared, published or used for critical design decisions. The exhaustive design and validation process under-taken by Measurement Computing and other Test and Measurement companies, makes for a significant difference between most open-source designs and low-cost Raspberry Pi HATs and commercial measurement products. In order to bring professional-quality measurement products to the Raspberry Pi platform, Measurement Computing has released Universal Library for Linux™ (UL for Linux) and a family of HATs specifically for professional Test and Measurement applications. 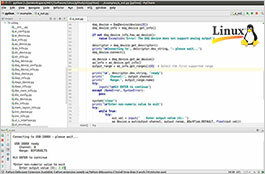 UL for Linux™ is an open-source Linux library which supports our most popular USB devices and provides a programming interface for both Python™ and C/C++®. This library is verified on multiple Linux distributions including Raspbian®, the distribution most popular on Raspberry Pi computers. UL for Linux and MCC’s wide selection of USB DAQ devices, greatly expands the capabilities of the Raspberry Pi computer. While USB is the preferred option for interfacing DAQ devices in many applications, it still requires an additional cable and box. When the form-factor and physical size of the Raspberry Pi is critical to the design, a HAT solution may be more appropriate. MCC’s family of HATs are specifically for the Test and Measurement and OEM/ODM markets. 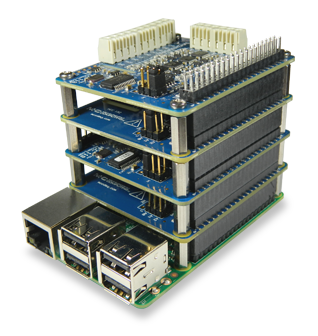 MCC DAQ HATs come with high-quality SW libraries that support Python and C/C++ to facilitate quick and easy development. Like all MCC products, the DAQ HATS are designed in the USA, use parts sourced through proven distributors, are fully tested and come with a 30-day money back guarantee and a 1-year warranty. UL for Linux is an open source, easy-to-use library with a structure similar to MCC’s Windows offering (Universal Library). It supports most popular MCC USB devices and comes with full documentation and extensive examples for both Python and C/C++. Its quality is assured by an exhaustive validation process that checks all features on all devices. The validation process extends to example programs and the installation experience on popular Linux distributions. Measurement Computing has announced two products designed for Test and Measurement applications that conform to the Raspberry Pi HAT standard. These devices provide data acquisition features in a small, stackable format with the same quality and support MCC has provided for nearly 30 years. The MCC 118 allows users to measure 8 single-ended channels of 12-bit data at an overall throughput of 100 kS/s. Eight devices can be stacked on a single Raspberry Pi to create a 64-channel data logger device capable of reading data at a combined rate of 320 kS/s. The MCC 152 provides two 12-bit analog outputs along with eight 5 V or 3.3 V DIO channels enabling the creation of a full multifunction Raspberry Pi measurement and control system. Whatever the need – a personal project or a data acquisition device – there are those who prefer to build it themselves and those who prefer to buy it. The key in making this build vs. buy decision is understanding the process, the risks, and one’s innate ability and skill level. As mentioned earlier, there are many open-source designs for Raspberry Pi HATs, and countless people have used these to build devices either from a kit or from scratch. Building these from scratch requires the skills to procure parts (or buy a kit), solder, and program chips natively using SPI or I2C. This is a fun challenge for those who have the confidence and enjoy searching message boards for programming advice and examples; for others it will lead to wasted time and frustration. The skill level of the user, the complexity of the device, the time allowed to complete a project, the budget, and the cost of failure tilts the build vs buy decision in one direction or another. This often tilts towards building a device in the maker and education market where learning is a key goal, and tilts towards buying the device in the industrial/commercial market where efficient use of resources and faster time to market are key goals. To illustrate the build vs. buy decision for a complex device, consider the design of the MCC 118 HAT that acquires data at a rate of 100 kS/s for a single board and up to 320 kS/s for stacked boards. While the Raspberry Pi has a quad-core processor which provides enough processing power to take and process single point measurements, it doesn’t provide enough processing power to maintain the high acquisition speeds of the MCC 118. The only solution for acquiring data at these speeds is to design the MCC 118 with its own microprocessor to ensure gap-free, accurate data streaming. This second processor adds an additional level of complexity that should only be attempted by someone who is very skilled in system design, firmware, and software development. Beyond the advanced skill needed to implement a solution, a more complex board like the MCC 118 also needs a proportional amount of device validation. Along with device validation, a complex device requires documentation so that it can be used effectively by others. MCC DAQ HAT products provide high quality measurements so you don’t have to compromise between accuracy and convenience. Buy with confidence with a 30-day money-back guarantee.